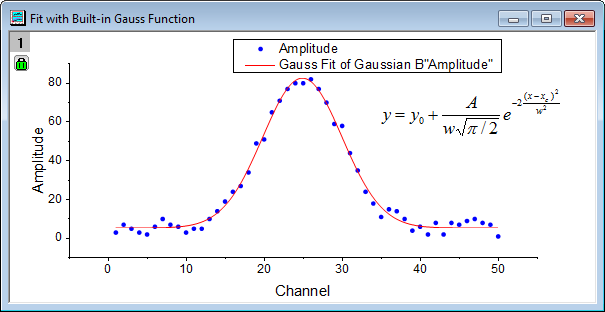 Curve fitting is one of the most powerful and most widely used analysis tools in Origin. Curve fitting examines the relationship between one or more predictors (independent variables) and a response variable (dependent variable), with the goal of defining a "best fit" model of the relationship. 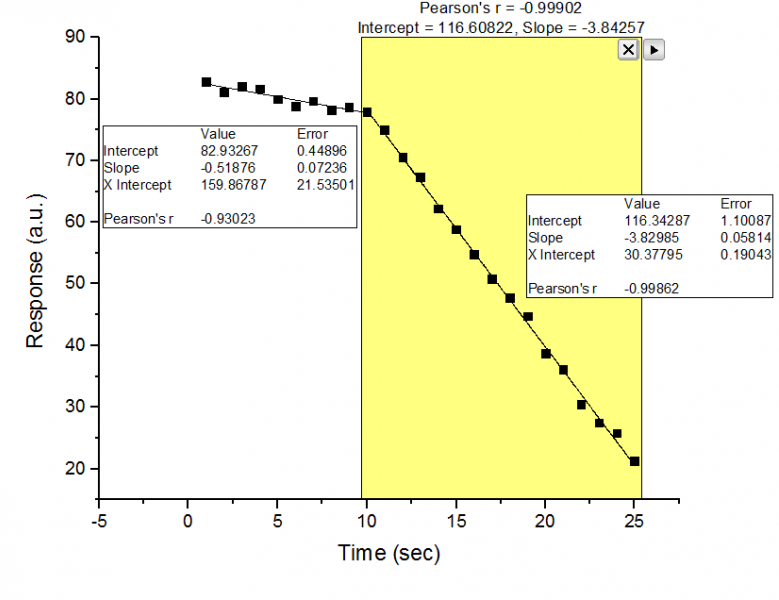 Origin provides tools for linear, polynomial, and nonlinear curve fitting along with validation and goodness-of-fit tests. You can summarize and present your results with customized fitting reports. There are many time-saving options such as a copy-and-paste-operation feature which allows you to "paste" a just-completed fitting operation to another curve or data column. 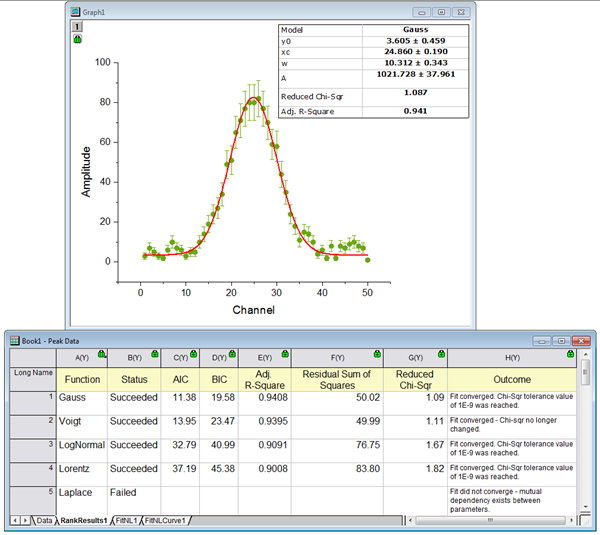 Curve fitting operations can also be part of an Analysis Template™, allowing you to perform batch fitting operations on any number of data files or data columns. Linear and Polynomial regressions in Origin make use of weighted least-square method to fit a linear model function or a polynomial model function to data, respectively. 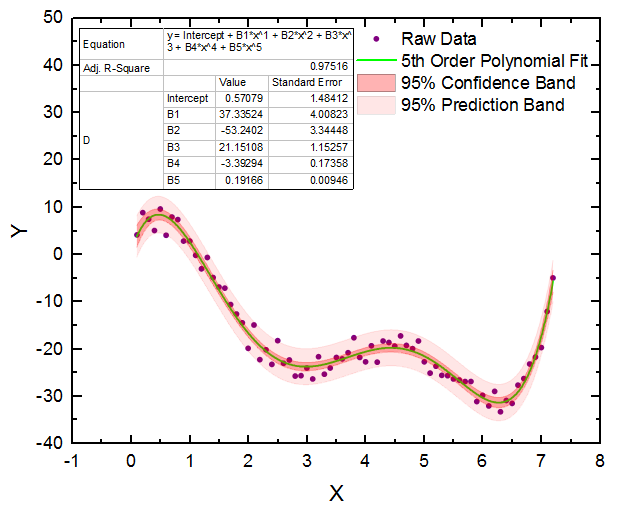 The Polynomial Fit tool in Origin can fit data with polynomial up to 9th order. Fixed intercept and apparent fit are also supported. 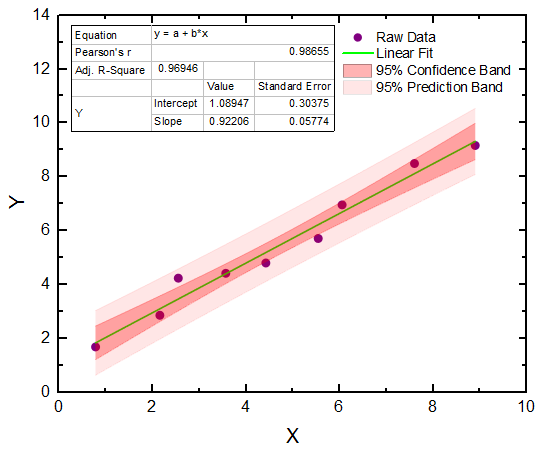 Graph displaying raw data, linear fit line, and 95% confidence and prediction bands. Result of an Apparent Linear Fit on data plotted with logarithmic Y axis scale. Linear Fit with X Error minimizes the sum of square of error on both X and Y directions, which is more practical for real experimental data where errors exist in both X and Y directions. Polynomial Fitting can be performed with polynomials up to 9th order. Fixing intercept is supported. 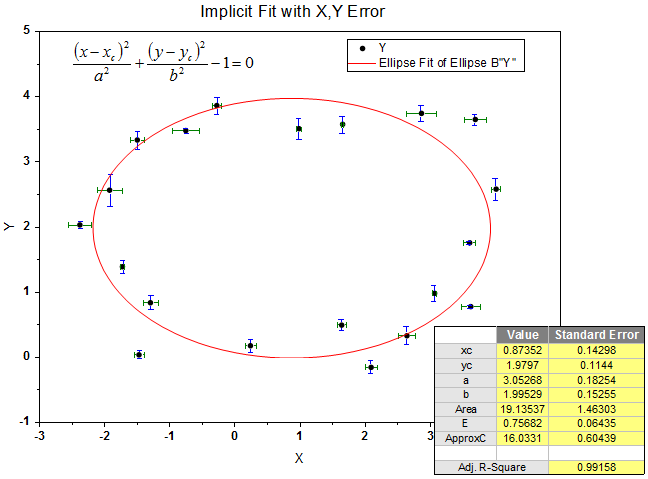 Apparent fit can also be performed with nonlinear axis scales. 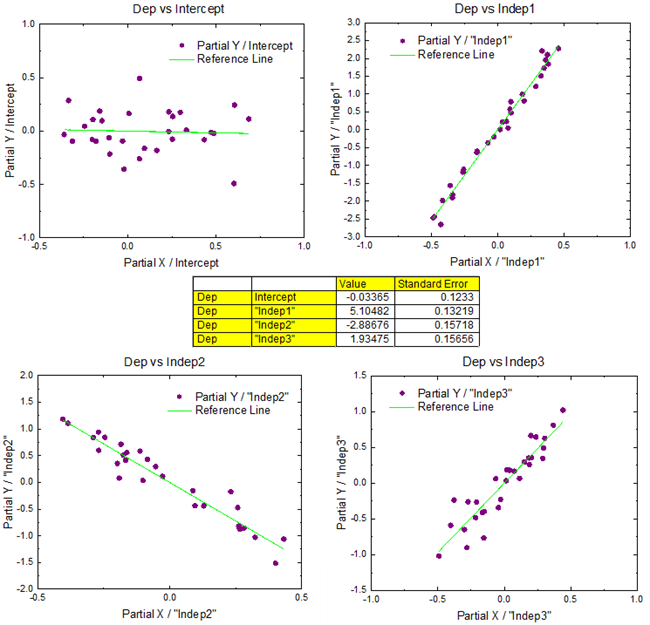 Multiple Regression with partial leverage plots to examine relationship between independent and dependent variables. Origin's NLFit tool is powerful, flexible and easy to use. The NLFit tool includes more than 170 built-in fitting functions, selected from a wide range of categories and disciplines. Each built-in function includes automatic parameter initialization code that adjusts initial parameter values to your dataset(s), prior to fitting. Can't find a suitable fitting function in the built-in function library? No problem. You can easily define a custom fitting function using our Fitting Function Builder. The Fitting Function Builder wizard can help you define a custom fitting function. Do you have multiple datasets that you would like to fit simultaneously? With Origin, you can fit each dataset separately and output results in separate reports or in a consolidated report. Alternately, you can perform global fitting with shared parameters; or perform a concatenated fit which combines replicate data into a single dataset prior to fitting. 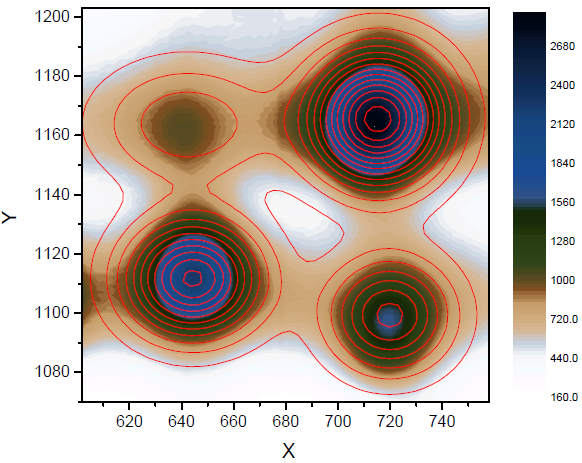 The image on the left displays a global fit where the width parameter has been shared. The image on the right shows replicate data fitted by internally combining all data into one concatenated dataset. Do you need to fit an implicit function to your data? Origin's NLFit tool supports implicit fitting using the Orthogonal Distance Regression (ODR) algorithm, including fitting with X and/or Y error data. Implicit Fitting uses the Orthogonal Distance Regression algorithm to find optimal values for the fit parameters. 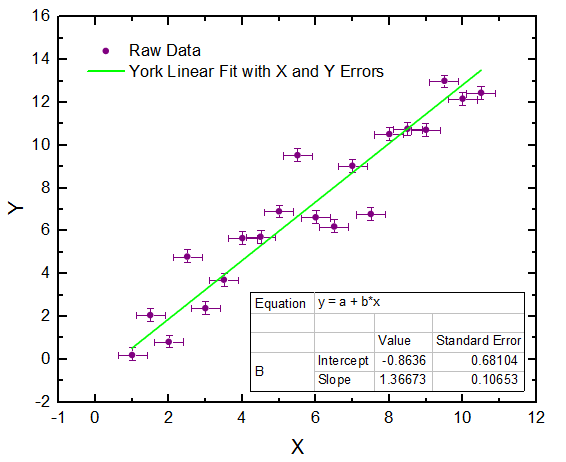 Errors or weights are supported for both X and Y data. Origin's NLFit tool provides an intuitive interface for fitting your XYZ or matrix data to a surface model. 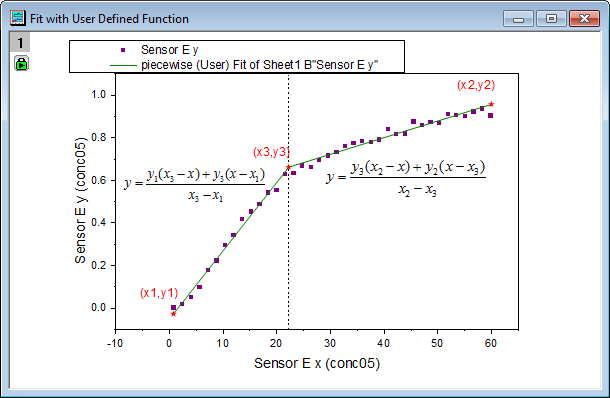 With this tool, you could locate one or multiple peaks in your surface data and fit them with the built-in or user-defined surface fitting functions. Surface fitting can be performed on data from XYZ columns or from a matrix. Over 20 built-in surface fitting functions are provided. You can also add your own function. The Rank Models tool lets you fit multiple functions to a dataset, and then reports the best fitting model. Results are ranked by Akaike and Bayesian Information Criterion scores. The Quick Fit gadget lets you perform regression on a subset of the data selected graphically using a Region of Interest (ROI) control. 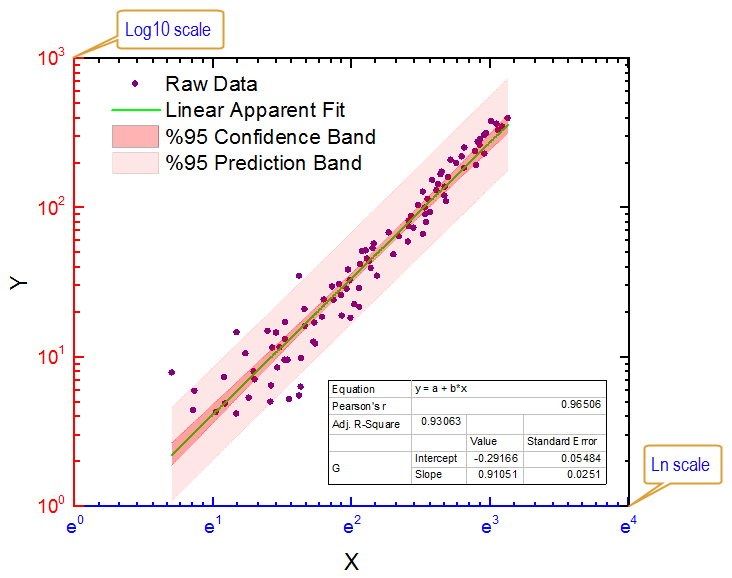 This image shows linear regression performed on two separate segments of the data. The fit results have been added as labels to the graph for the two segments.